Supporters of the proposed Nashville Medical Trade Center may see today's Special Metro Council meeting as a modest speed bump. Nonetheless, Council failure to pass a resolution backed by Metro Nashville Mayor Karl Dean could cause a shimmy in the trade center's front end, if not flatten its tires, entirely. A VNC interview yesterday with a key development executive suggests that if the convention center stumbles, it might not only make the Medical Trade Center uneconomical, but might also slow other local initiatives, including the proposed Nashville Entrepreneur Center. The Council will convene at 4:30 p.m. today for a special meeting for further consideration of an act creating The Convention Center Authority (CCA) of the Metropolitan Government of Nashville and Davidson County. The new convention center "has been a critical part of our whole rollout," according to Bill Winsor, the Dallas-based CEO of Trammell Crow's Market Center Management Company, which has proposed the Medical Trade Center. Winsor spoke yesterday with VNC. Winsor added that while he "wouldn't say" development of the $300 million trade center is "contingent" on the Music City Center's materializing, its absence would require his company to consider building needed space, itself. He noted that plans call for 1.5 million square feet of space to be created or secured during the next four years, with the initial 275,000 square feet open for business within a year. Such projects are difficult to finance, he said, even in the best of times, because they involve contracts for temporary use of space, rather than recurring rent payments that help make a project bankable. That makes adequate nearby convention facilties a crucial ingredient. Winsor is scheduled to fly out of Nashville for Dallas this morning. Although Winsor said he senses the new convention center is an idea that "has legs," as he departs he may nonetheless be looking over his shoulder toward the Metro Courthouse where the Council will convene. Winsor told VNC he and his team participated this week in 18 meetings with local business and government leaders, including one meeting with 30 members of Partnership 2010. Winsor stressed the Nashville Health Care Council's and Nashville Area Chamber of Commerce's roles in making those meetings happen. Winsor confirmed he also met again this week with Clayton McWhorter (left), one of the city's most influential healthcare and investment executives. McWhorter had earlier complied with a friend's request to endorse a competing project in New York City. McWhorter, a former president of HCA, an advocate of healthcare reform and the founder of private-equity investor Clayton Associates, explained a month ago that he'd allowed his name to be associated with the Big Apple's World Product Centre, as a favor to a longtime business associate who made the request. McWhorter told VNC in a recent followup interview that he naturally backs Nashville over any competitor as the site for a healthcare-oriented trade center. He added he believes that, "assuming you've got equal facilities," Nashville will hold its own with New York's WPC, and will strongly draw exhibitors and customers from within easy geographic reach of Nashville. Winsor told VNC that the New York City group had approached Market Center Management about collaborating. He said he told the group that his company has not, heretofore, been able to get a project "beyond pro forma" in New York City, due largely to Manhattan construction costs and other factors – and, he thus declined to be involved. Winsor told VNC that in his view, "the physics of trying to get this off the ground up there is more than Herculean." Winsor made clear he is undeterred by competing trade-center claims emanating from NYC and Cleveland, the home of a similar project, now underway. He said that Nashville's concentration of healthcare business and expertise, its manageable size and excellent geographic location, plus the city's surprisingly diverse entertainment and other amenities makes it a far better choice of venue for convening buyers and sellers of health care and medical hardware, technology and other goods, in particular. Winsor indicated he is particularly sensitive to health-technology opportunities within Nashville's economy. He told VNC he expects to hear more about technology, during a visit scheduled Sept. 1 at Vanderbilt University Medical Center. Entrepreneur and former VU Vice Chancellor Harry Jacobson, M.D. (at right), now retired and consulting to Vanderbilt and others, has been an early supporter of the Medical Trade Center project. Winsor said Jacobson remains supportive. 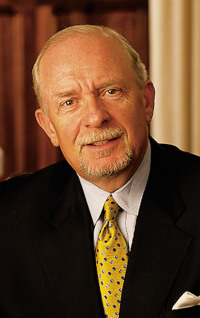 VNC research indicates that prior to taking the reins of MMC in 1993, Winsor spent 12 years running the former Dallas INFOMART, a technology trade center. Earlier, he was responsible for Texas Instruments' corporate marketing for several units, including digital systems and semiconductors. 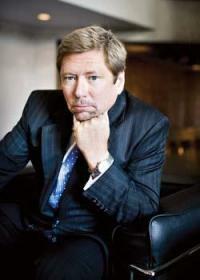 At one point, he was among the leadership of the Texas Innovation Information Network System. Yesterday, he told VNC that some Medical Trade Center ideas that are still under wraps could include programming and services for entrepreneurs, and could conceivably include housing the proposed Nashville Entrepreneur Center, a concept long supported by the Nashville Chamber, Partnership 2010, Nashville Capital Network, Nashville Technology Council and others. That doesn't mean he thinks the Nashville Medical Trade Center will be out of the woods, anytime soon. Alluding to the credit crunch that grips the nation, Winsor said, "Obviously, there are some hurdles we've got to get through." Meanwhile, he indicated he takes confidence from the Nashville project's financial backing by Crow Holdings, CNL LifeStyle Properties and others. He said the investor group is open to participation by local Nashville investors, as well. Winsor said he considers the project a "go." He illustrated the point by noting that Nashville-based executives with Gresham Smith and Partners will be visiting with his management team in Dallas next week, as part of their work on the project. Earlier, Winsor announced the appointment of David Osborn (right) as chief operating officer for the proposed Medical Trade Center here. 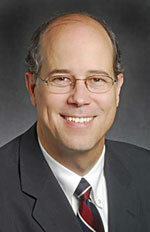 Osborn has long been associated with Vanderbilt's Center for Better Health, the Health Care Solutions Group and other organizations here. Winsor said he'll return to Nashville Aug. 31 for another round of meetings, and he indicated he believes that an agreement to buy an existing downtown building MCM has its eyes on could be done within a few weeks. On Tuesday, Aug. 18, the CCA measure now before Council actually won what proved to be a test vote, 37-2. However, Council Member Mike Jameson (left) invoked a rule that forced Council to defer the matter til today. In the interim, Jameson submitted an interrogatory to Dean Administration Finance Director Rich Riebeling, from whom answers are anticipated today. Many of Jameson's questions reflect concerns about whether a volunteer Authority will have adequate expertise and authority to oversee the proposed Music City Center convention facility.